As I moved everything back from college into my room at home, I knew there were things that I was going to have to change. As I make plans for teaching and directing this summer and beyond, I needed enough storage places to organize everything in efficient ways. Mom and Dad were very gracious to allow me to switch furniture from my room with other pieces in guest rooms. I worked for a few days sorting and rearranging everything, and am pleased with the way things turned out! And, it was all very inexpensive - I only had to buy one new thing! The view from the door into my room. The furniture is all against the walls, allowing me nice space to exercise and dance. It also gives me nice space if I need to spread out sewing or scrapbooking supplies! I used to have a full sized bed, but switched it out for this one, which gives me more floor space and more storage space underneath. The bedspread is the one I purchased for my college dorm room, and really enjoyed using. It is reversible, so I'm using the side that is more pink than purple. The full-length mirror is very helpful to me as I'm dancing and choreographing, to make sure things look right. It also makes my room seem more spacious! The bedside table is the one new item I purchased, but I found it for a great price - only $8! - at a local antique mall and flea market. This bookshelf is to the right as you walk in the door. The bottom shelf holds my scrapbooks, flute books, and drama books. The next shelf holds drama and ballet notebooks and resources. The next three shelves hold my personal books - many favorites that have been read quite often! Piled on the left are more books that didn't fit in the shelves, but they're ones I rarely read these days. My verse notebooks are also there for easy access. The top holds my ballet and drama scrapbooks, easy to get down to show others. My dresser is one our family has had for years. It's nice, because the drawers are large and I was able to nicely organize clothes and toiletries in them. Jewelery, hair items, and friendship memories are on top, and the Proverbs 31 Maidens poster I made reminds me each morning of the women I'd like to become in God's grace. My desk is another item we've had for years, and it held my computer when it was in another room. I decided that it would be most efficient if I had my computer in my room, and this desk gives me the space to hold it, as well as enough storage space in its many drawers and the bookshelf on top for files and more books. The shelves will be filled as I buy more books for continued education opportunities. The top of the book shelf holds pictures of my family, and the corner has a poem a student wrote and framed for me entitled "Dancing for God." The corner at the end of my bed is my sewing corner. The cabinet is one my parents got me a few years ago to hold a lot of sewing supplies, and my serger and sewing machines have their places on top. It was so nice how everything fit just perfectly as we were measuring the furniture to see how everything could be arranged! My closet is full, but actually very well organized. Nothing threatens to fall, should you open the door. :-) The shoe boxes hold, quite logically, my shoes! A container behind that holds dance costumes, with my bags piled on top. A small heater and plastic sacks for quick access find their place on the left side. My clothes are hung up - I have a lot, since I hang up most of my clothes, and mostly wear skirts/dresses. The top shelf has things organized in plastic containers. Clear, plastic containers, which I bought pretty inexpensively at Walmart, have been a lifesaver in terms of organizing everything. These hold scrapbooking supplies, old school notebooks, letters from friends and family, gifts I've bought on sale for others, and some drama supplies. It's amazing how much you can fit in one space by organizing them well! And, they aren't too hard to take down either. Underneath my bed I have utilized even more wonderful space to store things. In clear plastic containers (aren't they wonderful?) I have stored bedding supplies and fabric, and they pull out easily when I need to look through them. I also have my sewing basket tucked away in the corner, should I ever need to handsew something or take it with me! If you have any good organizational tips to share, please do! I'm always up for making things more efficient and hearing new ideas! Beautiful! One thing I have learned during this year of waiting to move is to periodically continue to de-clutter. 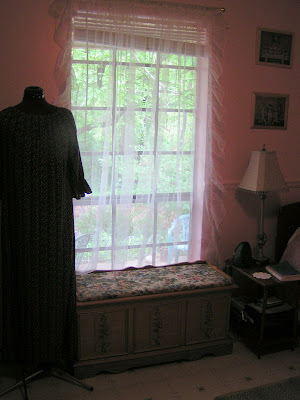 It is amazing how soon one can recollect items in areas that were once clutter-free! You haven't filled us in on your plans now that you aren't going back to school. Will you look for a job? How will you be spending your days? Thank you anna! I loved seeing your room! I remember those things! :D I am glad you worked something out. Michele: Definitely! I so enjoy de-cluttering and throwing things (like unneeded papers) away. It is so freeing! It is amazing how quickly it gathers, however. Anonymous: I have been telling so many people over and over again what I'll be doing, that it slipped my mind that I haven't shared it on my blog. I am not getting a "traditional" job, but am planning and preparing for a dance/drama ministry that I am starting as somewhat of a home-based business. I am teaching 3 weeks of dance classes and directing a musical this summer, as well as going to Ballet Magnificat's Teacher's Workshop, and probably beginning enrollment in CollegePlus or at least making plans. Although I won't be going to a traditionally college, I will be furthering my education through independent study and online opportunities. I just have to say how inspiring your blog is. It's so nice to see a young woman so invested in the Lord. It makes me wish I had grown up in a Christian family. I see how your family has helped to shape your life. You are very blessed. Your room is cute and organized!! And your dresser is pretty! Your $8table find reminds me of furniture my Parents have found at Antique Stores and Fleamarkets! Recently I rearranged the furniture in my room and I am still trying to organize everything! Thanks for sharing the pictures! I think I am going to use your idea of storage containers! How fun. I always enjoy your practical posts. You are so blessed in many ways-- my house hasn't a single closet! Yes, your bedroom is soo cute! Oh, and organized too! :D I think it would be a good idea to put the books, magazines, etc (such as Landsend, My Utmost for His Highest, The Redemption of Sarah Cain, Above Rubies, you know what I mean) you are currently reading in plastic boxes or bins (such as Rubbermaid) under your bed (if there was too much under there already, how about under a dresser or some other piece of furniture?). Well, just pick it up often and keep it tidy. It is pretty obvious that you are already doing that. ;D Your room is "spick and span"! My own bedroom is pink (although a much lighter shade of it than yours). PS: Ever read The Redemption of Sarah Cain? Or maybe you've seen the movie? The movie's called Saving Sarah Cain. Well, goodbye. Also, I know this is unrelated to organizing your bedroom, but how about making a new post, either about movies, your favorite dessert recipe, or your favorite hair "style"? I think that those are good ideas. Gotta go to church. Goodbye!